The show will also bring together a first-class creative team. 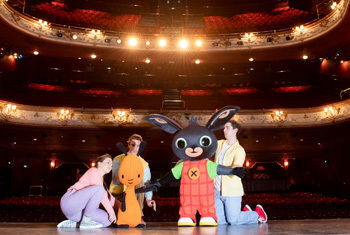 Bing Live is adapted for the stage by Helen Eastman with costumes and puppet design by Tahra Zafar. As Head of Costume, Hair and Make-up for the Olympic and Paralympic Opening and Closing Ceremonies staged in London, 2012, Tahra managed the production of 23,000 costumes for all four Ceremonies. Her film projects include: Star Wars VII The Force Awakens, X Men-First Class, Harry Potter and the Philosopher's Stone and The Fifth Element and for television: In the Night Garden, Zingzillas and The Adventures of Abney and Teal.